Receipts were 1984, including 417 packer cows, bred cows and pairs, 1567 yearlings and calves. Packer cows were steady to $1 lower. Packer bulls were steady to $1 lower. Market on replacement cows and pairs were $100-$150 higher on the better kind of cows. Market on steers and heifers weighing 500# and under were steady to $5 higher. Feeder steers and heifers weighing over 500# were steady to $4 higher. We had a good demand on steers and heifers and the bidding was active on the better quality cattle. A lot of the farmers are starting to put their wheat pasture cattle together. We had a big sale today – 1984 head and 417 cows. We will post the market report by 8:30 in the morning! Receipts were 1305, including 217 packer cows, bred cows and pairs, 1088 yearlings and calves. Packer cows were $1 to $3 lower. Packer bulls were $2 to $3 lower. Market on replacement cows and pairs were steady with a good demand. Market on steers and heifers weighing 500# and under was steady. Feeder steers and heifers weighing over 500# were steady. Bidding was very active on the wheat pasture cattle. Receipts were 1594, including 302 packer cows, bred cows and pairs, 1292 yearlings and calves. Packer cows were steady to $2 higher. Packer bulls were steady. Market on replacement cows and pairs were steady to last week’s higher market. Market on steers and heifers weighing 500# and under was steady to $2 higher with a good demand. Feeder steers and heifers weighing 600-700# was $2 to $4 higher, 700-800# steers and heifers were steady. We had another good run with the market being strong with active bidding. Receipts were 1825, including 282 packer cows, bred cows and pairs, 1543 yearlings and calves. Packer cows were steady to $3 higher. Packer bulls were steady to $2 higher. Market on replacement cows and pairs were steady to $75 higher with a good demand on young cows. Market on steers and heifers weighing 500# and under were $2 to $5 higher. Feeder steers and heifers weighing over 500# were $1 to $3 higher. 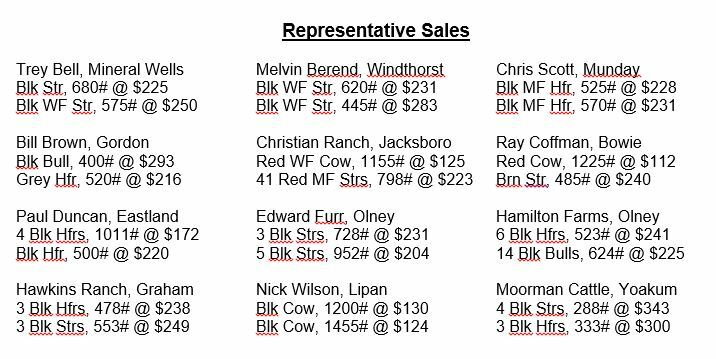 We had a good run of cattle today with bidding being very active. We had a good run today with 1825 head sold. We will post the market report first thing in the morning! We had a light run due to the holiday. Packer cows were steady. Packer bulls were steady. Market on replacement cows and pairs were steady to last week’s high market. 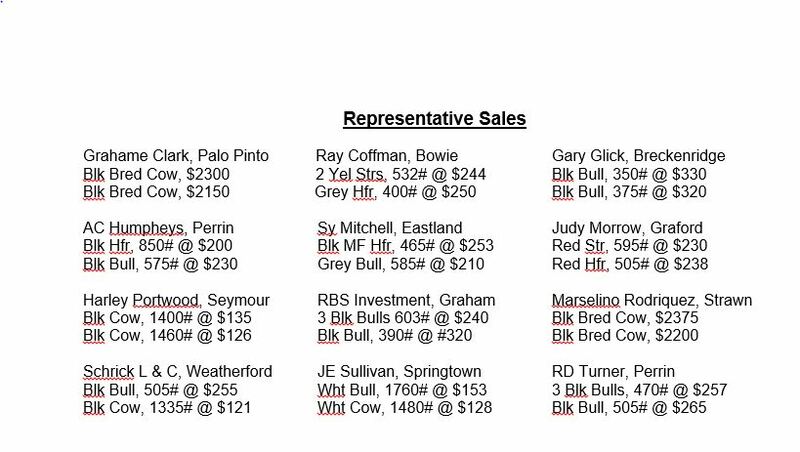 Market on steers and heifers weighing 500# and under were steady with a very active bidding. Feeder steers and heifers weighing over 500# were steady with a good demand. The market was strong on all classes of cattle.